Commentary: It was pretty exciting to see Taun We at retail in 2002, given she was such a strange looking alien and one that fans didn't immediately hate. Like some other CG races we've seen. No, Ms. We was a welcome release as a thin, tall figure with limited articulation. Her dress prevents much leg movement, but her head and arms and waist can swivel just fine. She doesn't pop apart, and her costume helps her keep upright without the assistance of a display stand. There's not a lot of color to her, but that's OK, this means she's authentic. The sculptors did a good job on her, except for one little thing-- she's short. Lama Su in 2003 is more than a head taller than she is, meaning the two Kaminoans look funky when standing next to one another on a display shelf. Solution: do not stand them next to each other. She's well-designed as a toy in that she won't fall apart, but all she can really do is stand around and look cool. So this one is a mixed bag, but a must-buy for fans of the character or race. Collector's Notes: This one-time release has since faded into obscurity-- don't expect to see her again. Be thankful she's cheap on the secondary market. Commentary: Back in 1995 (and through about 1998) this Stormtrooper remained a scarce item. Many fans were building armies for what they believed to be an inevitable large-scale Death Star playset (which never happened), plus because of the original Kenner line we basically all assumed we would never see a resculpt of it. (Oops.) Today, many fans from that era have crates of these and no real need for them given all the super-articulated versions which have since hit the market. Figures based on this beefier sculpt have basically been off the market since late 1998, although several were made before that time. Since he's from 1995, you have to remember, he was impressive for his age. The 1978 Stormtrooper had jointed arms and legs-- the 1995 version added a jointed neck and waist, which means it was a huge upgrade. He could not only sit, but look around! Saints be praised! Marvel of marvels!!! At the time he had no problem fitting in vehicles or playsets, and the more accurate helmet was seen as a real plus. As time went on, fans wanted more articulation, a less muscular pose, and a slightly better helmet sculpt. In late 1998, our prayers would be answered, and in 2004, we'd see even more improvements. But for the first few years of the line, this was it, and it was a decent toy. He could hold both of his guns, he could stand up without assistance, and he did indeed have more detail than the original Kenner figure from the days when the Star Wars saga was but a single film and some comic books. By today's standards, this figure is something of a joke (see below), but part of the fun of being in a hobby like this for the long run is that you get to see some real growth in the manufacturing output of Kenner, now Hasbro. The downside is that this figure is really little more than a curiosity, new fans probably will have no reason to pick one up unless they like strange releases. Collector's Notes: This figure was a popular "Swap out" in recent years-- if you have less-than-honest fans in your area, sometimes they will buy an item with a trooper or pilot and return the item with this figure in its place. (Don't think I don't notice.) Before fans were paying premium prices for this one, today you're lucky to get a buck for it. It shipped on pretty much every possible cardback variant during its era, and even had its legs resculpted to move the copyright from the back of the leg to the bottom of the shoe around 1998. Commentary: While I consider the "Ultimate Battle of Endor" Battle Pack in which this figure shipped essential, this particular Han Solo is not. On the bright side, he's super-articulated, comes with a working holster, and can be posed pretty much any which way you want. 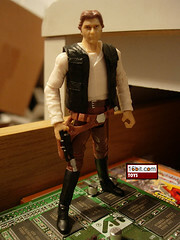 The figure is essentially a slightly redecorated version of the 2006 Han Solo Endor Trenchcoat action figure, minus the coat. It's a pretty solid release, but the proportions are a little off and Han's head could be slightly better. It's still a decent release and is a great figure for action dioramas, in particular the battle scene in which he is packed. Since it's similar to an older figure without a key accessory, you may not need this figure, but I'd say you wouldn't be sorry if you had this Han if you didn't have too many other Han figures. "More of the same" is only bad if you are drowning in "same," which you may not be if you're one of those fabled new collectors we hear so much about these days. Collector's Notes: While this figure has been off the market for a year and change, other figures based on the mold are available. 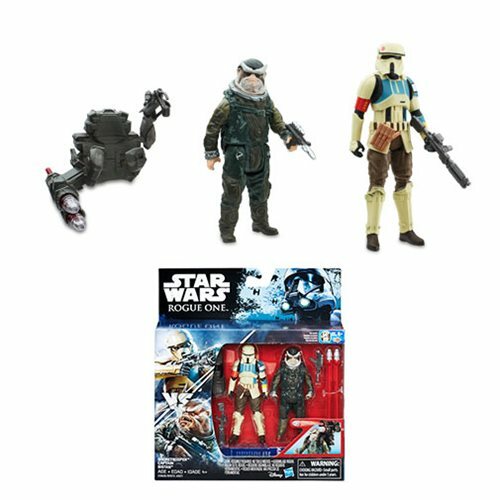 The same body with a different head is on the recent Endor Bunker-themed Battle Pack, and the Han Solo in Endor Trenchcoat vintage action figure from 2006 is generally easy to find. Image: Adam's Darth Vader TIE Fighter Galactic Heroes insert. Commentary: How many times can you reuse the same body for fundamentally different characters? Ibtisam is #3 of 4 so far-- the others being two Evolutions pilots last year, the next being Marvel's Shira Brie as a Wal-Mart exclusive. The figure retains the same super-articulated body with 14 joints, but adds a new head, a new helmet, and new hands. 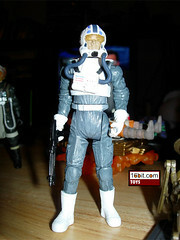 Obviously Mon Calamari feet should be bigger, but they aren't, nor have they been on other figures in the past. So for argument's sake, we're going to say she's basically fine. The figure retains the blaster holster and all that jazz, so that's useful, and her hands can hold a gun with minimal problems. She can sit, she can stand, and she looks great. Her giant blue head sits on her slender frame at a slightly strange angle, but it still essentially works just fine. The helmet slides right over her head, just like on the Mon Calamari Officer a few years back, so that's pretty great too. She's blue, which is pretty striking, and the coloring is much brighter than on most other action figures in this line. I think she's fantastic, and a great addition to my now quickly growing collection of pilots. Get this set if you see it, don't be a schmuck. Collector's Notes: This set is newly available. Its distribution has been spotty, so it may or may not be in your neck of the woods. Be patient, but if it's like 2010 or later when you read this, don't get your hopes up. Commentary: It's great to see Hasbro consistently coming up with new versions of Luke Skywalker that are more than an existing figure with a new hat or belt. This particular version is based on a comic book which takes place before The Empire Strikes Back in which Luke goes to track down his old pal Tank. The thing is, though, the figure looks a little bit older. Or rather, a lot older. Our hero has wind-swept action hair, a few marks to age him, and a simultaneously neat and goofy black suit covered in blue and copper colored markings. 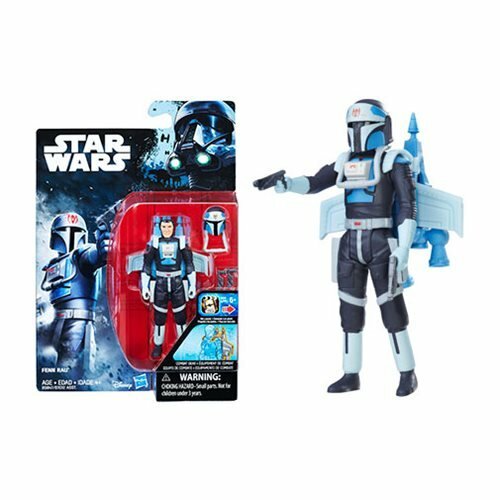 I like the fact it has Rebel faction logos on it, as few toys do, and the design does look like it stepped right off the comic page. The figure is essentially super articulated, with 12 places he can be moved. The figure doesn't have articulated ankles. Luke sports a working holster for his blaster, and a lightsaber which he has to carry. Oddly, the lightsaber doesn't match the one he was using on the comic cover, or in that era. What gives? Odds are the factory in China just used whatever mold was hanging around, I'd wager. This figure is a great addition to your collection if you're looking for something different or if you're a huge fan of the recent Dark Horse comics. Otherwise, it's something you could probably skip, if you really wanted to. Collector's Notes: This set is newly available. Deena Shan comes with Luke in a similar costume. Other characters also wore the suit, and I'd expect to see them eventually in future comic packs or in an exclusive boxed set of action figures. Image: Kashyyyk Galactic Heroes backdrop. Finally found a good use for the darned thing. Commentary: One of the things I've wanted for years but you couldn't care about in the slightest were figures from the post-ROTJ era of Marvel's Star Wars comic. I'm not picky- Luke, Leia, Ewoks, Kiro, whatever. So far it seems only Wal-Mart will take these characters, and this Keoulkeech is one heck of a nice little figure. He's clearly visible on page 6 of issue #94, "Small Wars." Our little friend here is a retool of Graak from 2007, except now he has a new head with smaller ears, a new Stormtrooper belt, and a matching helmet. Oh, and the spear. Because of what this is, I think it's fantastic. 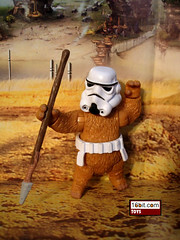 As a kid I actually armed my Ewoks with Stormtrooper guns all the time, as that's what happened in comics like this one and in the TV movies, so it's really wonderful to actually see a manifestation of this concept that wasn't a custom figure. If you like Ewoks, this set is a gift from the heavens-- get it. If you don't like Ewoks, well, you won't care now will you? Oh, and I've been told I should tell you he kinda looks like Fozzie Bear. Collector's Notes: This set is newly available. It also includes Machook and Kettch, none of which were mentioned by name in the comic book. Tippet at Wicket were called out in the book, and neither were included. One unfortunate thing about this set is that there were numerous other characters in the comic that would have made good figures, including a newly recolored set of Han, Leia, or Luke, Ackbar's "aide" Hirog, or Dani. Maybe there's hope for the future, but for now I'm just stoked Hasbro cranked out more Ewoks in this set than they had in ages. Image: Adam Pawlus' laundry room. Commentary: One of the most requested figures from fans in ages, Quinlan Vos was popular enough to warrant not one, but two action figures. This is the second release, and it retails the same basic articulation structure as the first. And the same legs. The head, arms, and upper body are new and more greatly resemble his look from most of the comic books. 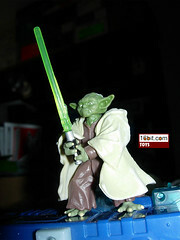 He retains the distinctive yellow facial stripe, the long hair, and the green lightsaber. His arms are super-articulated, but his legs are fairly weak-- the hips move, and they're restricted by the lower part of his costume. There are no knee or ankle joints, but there is a pretty swell holster for his blaster pistol. 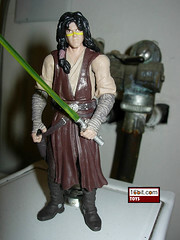 For fans of the character, this is the most Jedi-like version of the character you can buy. It wouldn't surprise me if this were the last version of the figure we ever saw, particularly because he's been missing in the fiction since 2005. (Maybe he'll show up on television some day.) With this all in mind, you can rest easy knowing that when you pick up this figure, it's one of the best and probably not going to be "upgraded" any time soon. Collector's Notes: This set is still available. Since it has a Clone, it's totally worth the purchase price. Commentary: One of the Imperials that fans have been asking about for ages is Colonel Wullf Yularen, mostly because he has facial hair and a unique white costume that really stood out on the Death Star. In early 2007, we got our wish, and now we see him as a younger man serving in the Clone Wars. The character's rank and history is complicated and likely full of contradictions, and the figure is similarly argued over. Cast in a cream colored off-white plastic, some fans insist he's supposed to have darker pants and a white shirt. I haven't really done the research to verify this, but the look of the uniform seems more "right" as seen here than with this costume. Based on the Jerjerrod body with the Ozzel legs, this figure has modified hands and a new head, plus the new coloring. He has difficulty sitting, but the cut joints at the shoulders, elbows, and wrists allow for limited movement above the waist joint. The head is a ball joint, and overall, this is a little weak because this figure and his box-mates were in a scene where they were all seated at a table, and none of these figures could actually sit at a table. It's unfortunate, but it still looks quite nice. Just don't expect to be able to properly recreate the briefing scene. Collector's Notes: This set lingered. A lot of web stores are out of it, but Suncoasts, movie stores, comic shops, and other smaller toy stores may still have it. On eBay, it isn't hard to get the set for under $25 before shipping is factored in. Given the set has six pretty great Imperials and yet another Darth Vader, I'd argue it's worth your money. You should be able to get him loose for under $10 shipped, which is why I think you should spring the big money and get the whole set instead. Commentary: One of Kenner's first "let's-do-a-head-swap" figures, this Darth Vader takes the then-best Vader body and combined it with a merely OK head. 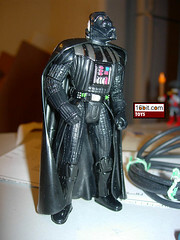 The body is from the 1998 Removable Helmet Darth Vader, which was notable for its swivel right arm and swivel right wrist in addition to having one of the least muscular builds the line would see until late 1999. The head is taken from another 1998 figure, the Complete Galaxy Death Star Darth Vader. 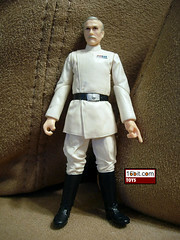 This release has a removable dome, exposing the back of the skull as seen in The Empire Strikes Back. While an OK figure in its day, it's not really anything special by modern standards. It looks nice, and the plastic cape looks excellent to this day, but it isn't super-articulated and its lower cloak pieces prevent him from being able to sit even if you remove his cape. As such, this is a great oddity for collectors or an acceptable display piece. As you no doubt have multiple Vader figures by now, there's really no reason for you to shell out the scratch for this one. Collector's Notes: The board game is notable for having a post-trash-compactor Luke Skywalker figure, but it didn't look all that great according to many fans. As such, this is a set you can probably forget, as history certainly has done so. Commentary: Packaged in a plain white box with a barcode, this Stormtrooper represents much of what fans wanted from Hasbro in this era. The company skimped on packaging and used the best-available Stormtrooper mold of the delay to deliver a fairly priced Stormtrooper that was sorta kinda widely available. (Units were later blown out in Wizards of the Coast retail outlets.) 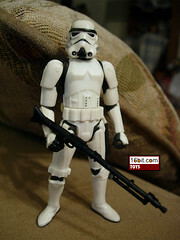 The figure is a whiter version of a 1999 Hasbro Stormtrooper, but the key difference here is that it lacks the temperature-sensitive blast-damage in addition to the gun rack. Because it's clean, I'd say this one is slightly better, but your mileage may vary. 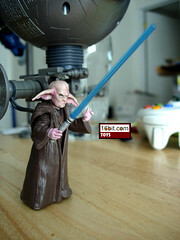 Collector's Notes: The sculpt started life in late 1999 as a Power of the Force CommTech figure. It went on to become a carded figure in the Saga and Original Trilogy Collection lines. 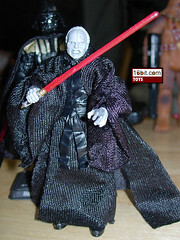 Commentary: Hasbro has done numerous versions of Emperor Palpatine, and even this mold has been cast in three unique paint flavors. This is the second of them, and it's pretty neat. Cast in grey, the figure takes on an even more ghoulish look than ever before, which is really what you want from a decaying old Sith. Sure, he never really looked this color on film, but in some comics it isn't all that far from how the old man appeared. Armed with the standard (for 2005) super-articulation, this guy has all the ball-jointed shoulders, eblows, ankles, and knees you could want. The cloak is removable, and the hood is a little bit too big. 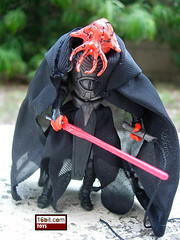 Actually, if you have the Evolutions release or the one from the Crimson Empire boxed set, you basically have this exact figure except for the skin color. I'd give this figure a strong "buy" solely because of the Clone Trooper he comes with, but your mileage may vary. I personally thing this figure's body could be better served with a different head sculpt, which is happening shortly, but there's still room for improvement in the head. The body, though, is about as good as we're likely to ever see. Collector's Notes: Arguably one of the best Palpatine figures, this was one of the more popular Order 66 figures in 2008. I blame the fact that it comes with another unique member of the 501st, which makes it a little more desirable in my book. Commentary: Since their introduction to the toy world in 2005, fans have been asking for a little bit more out of their Clone Pilot figures as seen in Episode III. Hasbro listened, and pretty much hit all the marks for improvement with this exciting figure. Now it has a removable helmet, is not peach colored in the face, and has ball-jointed elbows. This makes it a heck of a lot better, even though when it comes to a pilot figure being "good," my standards are basically "can it sit?" The good news is that it can, and even though it has pretty much the same legs as the 2005 release, that's a plus. If you need a figure to pilot your V-Wing, Gunships, ARC Fighters, or whatever, this is pretty ideal. This figure has joints at the elbows, shoulders, wrists, hips, knees, all that stuff. If you need to pose a figure for a fight, this is a good one. The helmet feels a little small, but it fits the figure's head quite well, so I really can't complain too much. It'd have been nice if they made this a specific pilot rather than a generic, such as Odd Ball, but that's life. It's a great figure and you should totally get it. Collector's Notes: Initially released as an Evolutions figure, Hasbro has since confirmed it's going to be carded in Summer 2009 basic figure assortment. Commentary: In the Star Wars: Legacy storylines, there's a virtual army of Dark Siders and Sith rather than the handful of baddies we're used to. In a way, it's kind of refreshing-- you can basically pop alien limbs on to any character design that looks like it came out of the Soulcalibur series and end up with something nifty. When I first got my hands on Lord Maleval, my reaction was "Squid Head's head, body by Namco." (The big eye in the middle of his armor looks a little bit like one of the weapons in the game.) As one of the few all-new sculpts in this boxed set, he's actually much taller than the other figures. This is a detail that was a real problem up until about 2001, when Hasbro really started making sure that Han, Leia, and Chewbacca were all different sizes. Now, it's not uncommon for a figure like this to be about a head or so taller than his squadmates, which is actually the kind of thing you want to see. Tall, black, and tentacley here has the full super-articulated range of motion which has become the norm-- 14 points, ball movement at the neck, shoulders, elbows, ankles, and knees. (Not hips. That's just the normal articulation.) Because of all of this, the figure can be posed to hold a weapon with one or both hands-- whatever works for you. He can also sit, more or less, but there's a large plastic... uh... codpiece of sorts that hangs down over his legs. It may or may not get in the way, depending on what it is you're trying to do. It still hangs down when he's "sitting" which is unusual for this sort of figure, generally the legs will just cause it to bend out of shape. As far as deco goes, it's a mixed bag. Since the guy is supposed to be this evil baadasssssss, he should be in black, and odds are it shouldn't show a lot of damage. If he has a bad rap and apparently godlike powers, he should look pretty pristine-- and he does. The body is molded in black with some very dark silver/grey highlights in certain places. Obviously, customizers will have a lot they can do here. The head and hands are a very bright red, in line with some of the Darth Maul figures we've had over the years. It's a nice contrast with the black, but some people complained that it's too red. I think it's OK, but then again, I'm pretty easy to please and I don't have much insight as to what a "realistic" squid-headed alien would look like after he joins a cult of evil and gets a makeover. I like this one, and I've already had many asking "so when is it coming out on a basic card?" The answer is probably "never" or "so long off you'll either have caved and bought the set by then or quit the hobby." So if you like it, I suggest buying the set or coordinating with a fan to trade for theirs. Collector's Notes: Full disclosure: we asked for this from Hasbro as part of my day job at, you guessed it, Entertainment Earth. As a character who didn't last long in the series, he managed to make a good first impression and that's likely why there's a toy of him right now. It's still available, having just come out, so there ya go. Other: If you enjoy this column, and have liked some of the past 1,000 entries, please do tell a friend. This feature is not something that pays, really, we do it because you like it. And if you keep reading, I'll keep doing it! Commentary: Hasbro sure likes to recycle parts! While it can get annoying with some figures, I actually quite like to see it with the likes of the Snowtrooper. Why? Well, if you're the kind of person who likes having a small army, it's really great when not every figure is in the exact same pose. This one takes the figure from the waist-up from 2003 and bashes it together with the legs from the 1997 edition, resulting in a release that actually stands up better and is a little more stable. In other words, Hasbro engineered this figure to be superior from its predecessors without using any new tooling. That's really impressive. For 2006, this figure didn't have great articulation. You've got shoulders, neck, waist, and hips-- that's it. As such, this figure may not be ideal for all dioramas, but if you need troopers to fill out a scene or to fill out an AT-AT cargo hold, this is a good one to pick. The deco is great, there's not a lot of mud or brown here unlike the early modern Snowtroopers. Oh, and his blaster fits into his holster-- a nice touch! 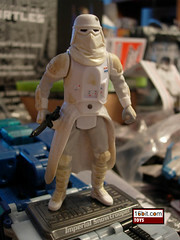 Collector's Notes: A fairly strong seller in 2006, this figure has since been rendered obsolete by future releases-- namely the "Vintage" Snowtrooper, which was just reissued on a basic cardback with more accessories. As such, don't get this one as your main Snowtrooper, but if you're wanting multiples make sure you get one or two of these to fill out the ranks. Commentary: If you thought you saw Even Piell before, you're right. Hasbro made one in 2003 [FOTD #155], but it was painted slightly differently and didn't include a lightsaber. Since a lot of fans joined the hobby since then, and others don't mind re-buying slightly different and improved figures, this is one you may wish to add to your collection. The figure is still basically the same-- no useful leg articulation, limited arm articulation, etc. This figure was designed to stand around and look good, not to sit in a chair or anything like that. Now that he has a lightsaber, he's a little more interesting. After all, standing around and pointing is fun, but nothing says "action" like an actual small plastic weapon. Hasbro is pretty good at making toys, but this is basically a diorama/collector figure. It looks cool, and it's reasonably sturdy (the arms may pop apart), but you really want to leave this one in dioramas. If you get only one Even Piell, this is the one to get. Collector's Notes: Either release of Mr. Piell is pretty good, but this one's overall deco is slightly superior. If you want the Jedi Council bases, get the 2003 Saga Scene. If you want superior paint and a lightsaber, get this version. If you don't care, go buy another Boba Fett. The figure is pretty much out of circulation as of today, so if you see it you may wish to snap it up. Commentary: Oh, Yoda. For a character with five movie appearances and now several TV appearances, your action figures lack variety. The little green Jedi master has basically one outfit with some slight changes, and yet there are over 20 different Yoda action figures. It's quite amazing when you think about it. This particular one was designed to be from Revenge of the Sith, but I'm pretty sure it's either from Hasbro's imagination or a deleted scene. Collector's Notes: Hasbro loves this Yoda. It has since been repackaged as-is many times, plus a few other times with new and/or different cloaks and weapons. Odds are you own this Yoda in some form or another. Commentary: Is it a Rebel, or an Imperial? With R4-I9, it seems either Hasbro or Lucasfilm screwed up. Basically, there have been enough errors where I'm willing to say that nobody has their story straight on R4-I9 and R4-D6 [FOTD #818]. There have been errors made in either backstory, identification, or perhaps other things too. What you need to know is that both are pretty cool, and the molds used to make each are different. 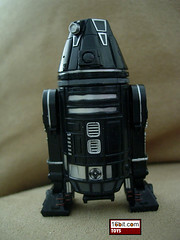 R4-I9 was made based on the R4-M9 mold from 2002, except it's black and silver now. It looks really great, and is articulated at the dome, the feet, and at the... shoulders? I'm never sure what to call these limbs. Since it was a pre-2004 figure, the body is a little bit taller and thinner, and the details aren't as precise as they were on the new bodies introduced from 2004-2009. So in other words, there's a little room for improvement, but odds are Hasbro won't have a reason to take the current build-a-droid R4-style body and paint it in this color. (But if they do, I'm buying.) The deco is great, the detail is good, but the real question is concerning if this droid belongs to the Rebellion or the Empire. There's room to fudge the facts, and since droids are basically appliances, there's no reason any one droid couldn't appear in pretty much any scenario. Collector's Notes: The set also includes a Stormtrooper, Darth Vader, and AT-ST Driver. R4-I9 himself was reissued in 2007-2008 as part of the 30th Anniversary Collection line of Saga Legends, and as such can be had for a reasonable price. As far as I can tell the two droids are identical. It's different enough that I suggest you make sure you own a black R4-I9 in your collection. This mold was reused to make several other cone-headed droids over the years up until about 2006. Commentary: For years, fans have been pleading with Hasbro for a new Jabba figure. 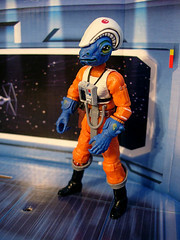 So when he appeared in The Clone Wars, we assumed it'd be a great item to expect with the toy launch-- it didn't happen. We did, however, get a Rotta figure as an accessory for Ahsoka Tano. Since he has joints and paint, I consider it a figure. The little guy is pretty simple, each arm is articulated, he has a paint wipe on his body to highlight his various wrinkles, and his eyes are painted as well. He looks basically like he did in the film, which means a lot of you will probably hate him. For what they aspired to do, I'd say it turned out quite well. I don't think there's much room for improvement, especially at this tiny size, so you can buy this figure with the full confidence that you probably now own the best version you'll ever see of this tiny Hutt. Collector's Notes: Believe it or not, kids are buying this figure up and it's actually somewhat hard to get right now. As a new release, you'd assume you might see some, but this doesn't seem to be the case most of the time. 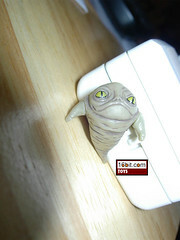 Also, this is the second-ever Hutt character to be made as a toy. Consider that Hutts were first shown to fans on the big screen in 1983 (earlier if you count comics and whatnot), that's quite the gap. 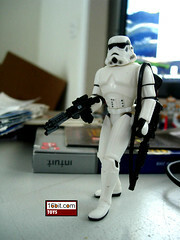 Commentary: Hasbro loves the Evolution Clone Trooper body. 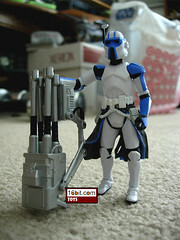 That's why they used it for this Clone Trooper with some modifications. You get a fancy skirt, a new helmet, and a huge freaking gun. 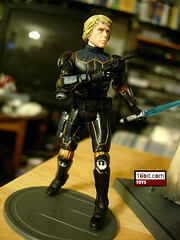 The figure is essentially super-articulated, modeled after the crazy heavy gunner in Fordo's squad. What's funny is that this is the second attempt at the figure, and the first one, well, it kinda sucked. (The gun did, at least.) Hasbro made good by making a figure with the correct helmet, with more articulation, and with a big honking gun that comes apart in a few pieces. It connects to his back, and can be held in his hands with a little bit of work. It isn't a perfect fit, but it works quite nicely. Now that we have one of the more interesting clones from the original series, the question is when will Hasbro make a really good Fordo with the right name and the right deco? Not to complain, this is a great figure, but c'mon. Fordo. Collector's Notes: This figure is new, and still shipping. Because of this, it could come with any of several different build-a-droid pieces. Be sure to keep an eye open if you wanted a specific part. 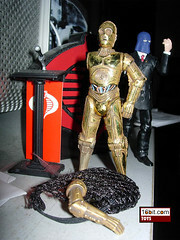 Commentary: This is one of the best (and the last) C-3PO action figure to be released under the "Kenner" brand. In 1998, the company went and released its first few "resculpts" on individual cards, thus leading to the constant hey-don't-we-already-have-this? marketplace of today. Back then, though, the figures were obviously newer and improved with awesome accessories or significant deco changes. C-3PO here has massive amounts of dirt and grime on him that don't necessarily look good in a flash photo but it looks wonderful in person. Sure, he only has five points of articulation, but he looks awesome! The arms and legs and even head pop off and can be stored in a "rope" backpack which was included for Chewbacca, which works if you're willing to fidget with it a lot. In other words, it doesn't quite work perfectly, but it looks nice and I gotta say I admire the fact that they included an accessory for the droid. What you see is basically what you get-- a neat figure with good deco and a decent accessory. One of the amazing things about it is that 11 (or possibly more) years later, it's still one of the best. 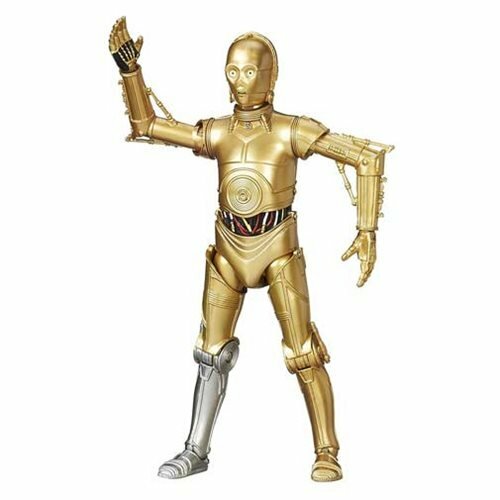 Collector's Notes: This figure was never reissued, but many other C-3PO figures were. None of them looked this good and had this many removable parts, though. Commentary: Some fan argue that there's a split in the current line between "old" and "modern," but I'd say that isn't true just yet given how much stuff tends to stay in circulation. 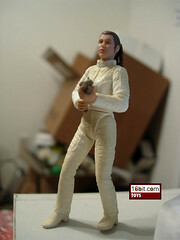 However, this Princess Leia Organa figure does represent a split for the character and how she was produced as a toy. For example, they actually tried a little harder to make her look like a woman, plus she's the first-ever "short" Leia-- most other versions of the character were rather tall. (She came out at the same time as the first "tall" Chewbacca.) The figure had some difficulty standing up straight, which can be helped by a stand or large amounts of patience. She has eight points of articulation-- the basic six, plus swivel biceps. This helps her hold the blaster with both hands, which is a pretty useful thing for her to do. Unfortunately, she can't do much else, and the figure is basically "stuck" in a run-and-gun pose. Thankfully the costume was well-sculpted, the head was designed nicely, and the figure can actually sit. Unfortunately, this is the only Bespin Escape Leia and may continue to be the only one, thus depriving you of having a Leia sit in the Falcon canopy that can run around and yell and stuff. Well, I guess she can do that. The "firsts" don't stop with the figure. Her accessories were notable too, as she had the first "current" sized Imperial blasters. Sure, they were gold for some reason, but they were the first blasters that weren't as big as a figure's arm. That's pretty exciting stuff, or rather it was if you bought it in 2001. Today you probably don't care so much as now it's kinda old, but it's still being used. This figure is worth getting because she looks right, but fans wanting a figure with more aren't going to find it here. 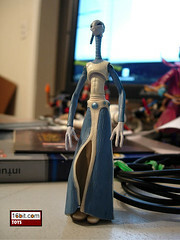 Collector's Notes: This figure was never reissued, but she was reasonably easy to get back in early 2001. This figure actually would make good sense to release in a battle pack, preferably with slightly darker or different eyebrows. Commentary: One of the last dozen or so figures under the Kenner brand was this Mara Jade, an-- at the time-- long-awaited and not-really expected release. For the first few years of the modern line, the ratio of "figures that were made in the 1980s" to "new stuff" ratio was basically 10:1, if not greater. There were roughly 27 Luke figures in the first four years, so we were really, really happy to see new characters like this. Even if they weren't really all that great. Mara had an iffy face and a fairly thick neck, but somehow they basically got the costume right. The leather (I assume) getup has the knee pads, the gloves, and the hood with the goggles. Were it not for the head or the lack of articulation, this figure probably would have been just fine by most fans' standards. She can stand and sit, but odds are you're going to want to use a display stand of some sort with her. She does tend to topple over. As a figure at the end of the "figures as actual toys" era, she's great. It's not like her head is going to pop off, like the 2007 release, but then again she is in her black outfit. Which, to date, is unique to this figure. If all you need is one Mara figure, it really doesn't matter which one you get, but technically each release is a different outfit. So you're probably going to want to buy both if you care about such things. Collector's Notes: This figure may as well have never been released in 1998 it was so hard to get. As time went on, fans stopped being interested in her and the prices on the secondary market eventually declined. So today, she's cheap, and that's a good thing. 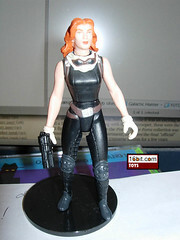 She was never reissued, and this was the only release of Mara Jade until the 2007 Luke/Mara comic pack.